After three years with Puesto, Executive Pastry Chef Jessica Scott has relocated to the East Coast to pursue a new opportunity, but the popular modern taqueria has found a new talent in Chef Erik Aronow, who previously worked under a Food & Wine Best New Chef honoree. 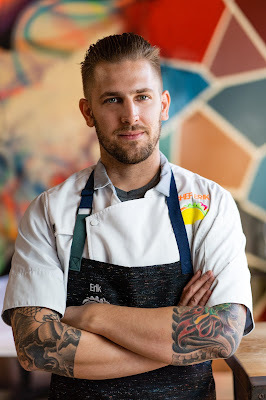 Born in Los Angeles and raised in the San Fernando Valley, Chef Erik Aronow has spent the past 15 years honing his skills at a handful of Los Angeles’ most revered, innovative and finest dining institutions. After attending Le Cordon Bleu in Pasadena, where he studied both savory and pastry techniques, Aronow had an early stint at Thomas Keller’s Bouchon Bistro in Beverly Hills. He later found himself in the kitchens at Red Medicine, Republique, Ink and, most recently, the boundary pushing Destroyer. He spent time under Top Chef winner, Michael Voltaggio, while at Ink before finding a mentor in Food & Wine's Best New Chef winner Jordan Kahn, the singular chef at Destroyer who went on to open Vespertine. It was while working with Kahn that Aronow decided to solely pursue pastry as his specialty. Kahn taught Aronow that pastry is more than creating a dish with sweet flavors - it’s a balance between extremes. While under Kahn as Executive Sous Chef at Destroyer a plant focused fine dining restaurant, Aronow pushed limits, questioned the norm and found inspiration in art, color palettes and life experiences. Aronow moved to San Diego in the fall of 2018 to lead Puesto’s pastry program as its executive pastry chef, signaling a significant gain to our city’s culinary talent. Fascinated by regional and ethnic cuisines, Aronow will create desserts for Puesto with a focus on traditional techniques utilizing indigenous Mexican ingredients. While he is based in San Diego and will be focused mostly on the La Jolla and Seaport Village locations, he will travel to all Puesto outposts throughout California to curate each menu. Puesto's sixth location opens next month in the Northern California city of Concord, and Erik’s new dessert menu for Puesto should make its debut later this month. For more information on Puesto, visit eatpuesto.com.